Recommended Name: � the "portrait d'Allemagne". Other name: the Lyon I pattern. Variations: Fribourg pattern; Neuchâtel pattern. The "portrait d'Allemagne" has for long been neglected. For D'Allemagne it was only a Lyons export pattern. It was Sylvia Mann who gave this pattern its true place; she called it the "Lyon pattern I", and demonstrated that it was the source of a family of patterns which went to Germany, Switzerland and finally Austria - where it is still alive. Recent investigations have shown that this pattern was specifically made in Lyons for export to the Germanic countries, and that it can be identified with the "portrait d'Allemagne" (German pattern) quoted in the Lyons archives as well as in woodblock inventories made in Chalon-sur-Saône (1701) and Dijon (1752). Carried to Switzerland around 1750, the "portrait d'Allemagne" settled in Fribourg, then in Neuchâtel. The Swiss versions differ very little from their French model, save for their very typical decorated aces. The "portrait d'Allemagne" has also supplied courts to a range of German animal tarots in the 18th Century. Adopted at the same time in Austria, it took refuge in Vienna where it became the Wiener Bild or Vienna pattern (which deserves a separate pattern sheet). Although the costumes seem to go back to the 16th Century, early examples of the "portrait d'Allemagne" do not date back earlier than 1590. This pattern shares many of its courts with other Lyons-style patterns, notably with the Lorraine/Burgundy pattern, with which it has a close affinity. K grasps a ticket (or a playing-card); the other kings hold maces (which turn to sceptres in the 18th C.). Q and Q are wearing hoods with flat biliments (as was fashionable in the mid-16th C.) with their crowns pulled backward. Q is in profile and has box-shaped ermine sleeves. J holds a banner or rather a pennant. The J , walking in profile, has plaited hair (looking like a snood) under a strapped flat beret; he holds a kind of long arrow pointed downward, topped with heart-shaped feathering, and bears a sabre. Maker's name appears in banderols on J and J . In the Fribourg and Neuchâtel patterns the end roll of the banderol on the J is changed to a straight trumpet with flag showing an eagle. The earliest packs that have reached us are nearly complete (52 cards). We may simply suppose this pattern was produced in 52-card packs, along with 78-card animal tarots. Lyons: J.V. (late 16th C.), Antoine Janin (c.1590-1610), Claude Valentin (1650-1676). Dijon: Pierre Madenié (1710-1740). Salins: Amable Saignelonge (1st half 18th C.). Ratisbon (Regensburg): Franz Dominik Miller (c.1770-1790). Breslau (Wroclaw): anonymous cardmaker (2nd half 18th C.). Fribourg: the Burdels (late 18th C./19th C.), A. Favre (c.1851-c.1863). Neuchâtel: the Rochias (early 19th C.), J. Heggli (c.1850). Lausanne: D. Vachet (early 19th C.). Mümliswil: B. Schaer (c.1800). Schaffhausen: L. Müller (2nd half 18th C.). As animal Tarot courts: Strasbourg: L. Chaso & I. Henrion (c.1740). Ulm: J.W. Weber (c.1745). Nuremberg: J. Forster (c.1750). Liège: G. Larmoyer (1753). Stockholm: S. Blomberg (1766). An. : Catalogue of regional patterns. 1. 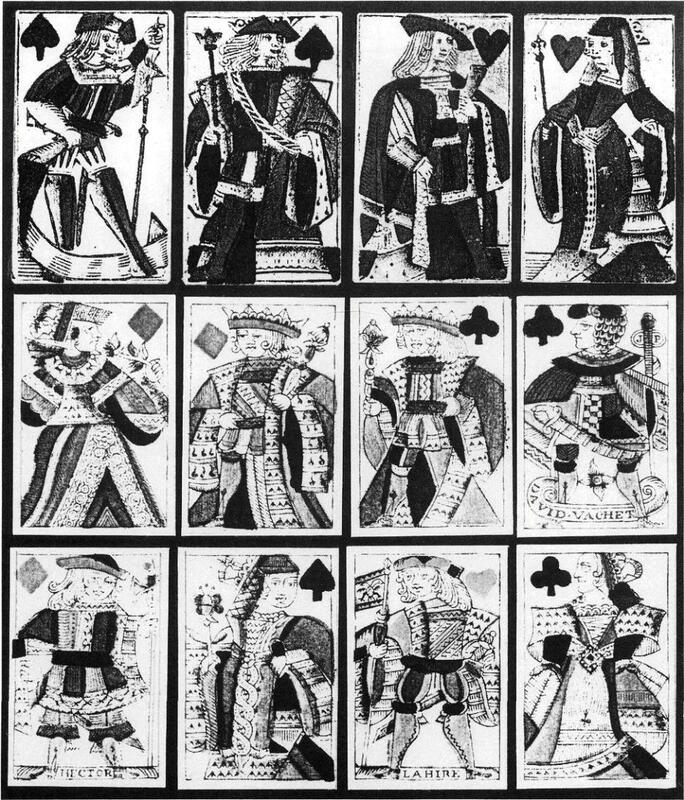 The French-suited Austrian pattern also known as Wienerbild or Viennese portrait, and its related ancestors, (IN) The Playing-Card, 1/2,1972, pp.18-21. DEPAULIS, Thierry: Un inventaire de 'moules' de cartier en 1701, (IN) The Playing-Card, XXIII/2, 1994, pp.45-50. EBERHARD, Balz: Les cartiers fribourgeois, Fribourg, 1987 (2 vol.). HAAS, Walter: Der freiburger Spielkartenmacher Alphonse Favre, (IN) Freiburger Geschichtsblätter, 71,1994, pp.173-212. KELLER, William B.: A catalogue of the Cary collection of playing cards in the Yale University Library, New Haven, 1981 (FRA 89, GER 18, GER 19, GER 20). MANN, Sylvia: Alle Karten auf den Tisch / All cards on the table, Leinfelden-Echterdingen and Marburg, 1990 (Nos. 159-160). RADAU, Sigmar: Tiertarock: Entstehung und Verbreitung der Tarocke mit französischen Farben, Munich, 1989. Schweizer Spielkarten, Zürich, 1978 (Madenie: Nos. 77-78; 'freiburger' Bild [portrait de Fribourg]: Nos. 79-87; 'neuenburger Bild' [portrait de Neuchâtel]: Nos. 88-94). Top row: Some courts from the reproduction of the J. V. pack (former Mann coll.) by Scolar Press.